Colorado’s state Capitol in downtown Denver. 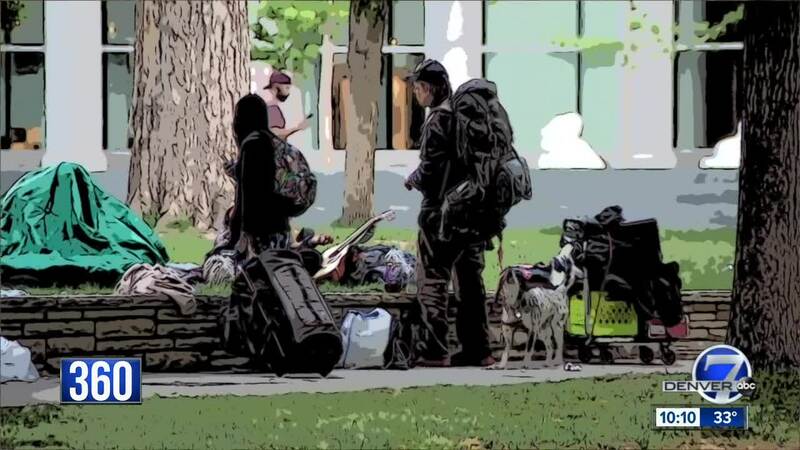 DENVER – Day after day, from Denver to Colorado Springs, people are living on our streets, in our parks, in their cars or anywhere else they can find. The used needles, human waste, and tons of trash are what many have come to expect at many homeless camps. "It used to be grass and everything; no more grass. It's all just dirt now," said Michael Sinnot, who works across the street from a homeless camp in Colorado Springs. "We go to the bathroom and we'll find needles and used baggies." Everyone agrees there's a problem. But what is the solution? Some Colorado lawmakers want to make felony drug charges a thing of the past . They see it as a way to stop "arresting away" our drug problem, but critics argue it comes with a whole host of other issues. "The war on drugs has completely failed," said Rep. Leslie Herod, D-Denver. "The system is broken and this is a way to fix it." Herod is sponsoring HB19-1263 , which would “defelonize” drug possession for all Schedule I and Schedule II substances. The drugs include heroin, fentanyl, cocaine and most other illicit substances. Under the proposed measure, those caught with small amounts of these drugs would face a misdemeanor instead of a felony charge. "You have that felony hanging over your head, and you can't get a job, and you can't get housing and you lose hope," explained Herod. The idea is to keep those struggling with addiction out of prison in favor of treatment. "Most importantly, this bill doesn't eliminate the opportunity for a judge to sentence jail time," said Herod. "We're not saying it's no longer a crime; we're not saying that simple possession is something you're going to get a slap on the wrist for. One-hundred eighty days is still 180 days in jail." Supporters believe the bill is an effective way to stop addressing the growing drug problem through jail and prison time and a way to save taxpayers money. A report from the Joint Budget Committee found savings anywhere from $8.6 million to $13.7 million over the next five years should the measure become law. It’s money proponents want to use through a grant program to help find new treatments and substance abuse treatment centers. A recent amendment to the bill adds a $7 million jail support grant and Rep. Herod said she plans to add another change which will move an additional $2 million into the fund for community-based partnerships to support efforts to reduce jail populations, expand diversion programs, and increase mental health and addiction treatment options. Lawmakers estimate there about 200 offenders across 64 counties statewide that would be impacted and don't anticipate it overrunning any single county. Sinnot, who works next to a homeless camp in Colorado Springs, said he thinks the proposal would make the problem worse, not better. "People wouldn't be so afraid of getting a felony, so I pray that doesn't happen," he said. Brandon is one of those struggling. He has been living out of his girlfriend's Jeep in Colorado Springs for three years and has experienced firsthand the negative impacts of a felony conviction. "Unless you have an intent to distribute you shouldn't be charged as a felon and ruin your life," he said. Brandon said he is not a drug user, other than marijuana, but has other felonies on his record for check fraud and falsifying information to a pawn broker. "It's hard to find a job. It's hard to find a place to live because a lot of apartment complexes won't take felons," he explained. "My goodness, Denver is about to turn itself into the homeless capital of the Rocky Mountain region," said 18th Judicial District Attorney George Brauchler. Brauchler said he believes the motives behind the bill are pure and acknowledges the problem, but says he is concerned about what he calls the unintended consequences of the bill. "All we've done is push those dollars that are going to be spent from the state and to the county," he said. Instead of going to state prison, Brauchler said those convicted of drug charges will end up in county courts and county jails at the expense of taxpayers in those communities. Brauchler also points to the drug sentencing overhaul Colorado went through in 2013, which made it possible for those convicted of felony drug charges to have it automatically changed to a misdemeanor if they meet all the court requirements – including getting treatment. "This bill takes that incentive away," he said. Those in favor of the changes to drug charges believe the recent changes haven't worked. They point to this recent report from the Colorado Criminal Justice Reform Coalition . It shows drug felony case filings have more than doubled since 2012 – from nearly 7,500 to more than 16,000 cases last year. Seattle introduced the Law Enforcement Assisted Diversion (LEAD) program several years ago, an effort to divert low-level drug users out of the criminal justice system and into community-based treatment. The Denver Police Department launched its own version of the program earlier this year. A University of Washington study found Seattle's LEAD program helped reduced recidivism rates by nearly 60 percent. But critics point to a recent KOMO news documentary called “Seattle's Dying” as a warning sign of the impacts we could see in Colorado if this legislation passes. Elder is urging lawmakers to watch the documentary. He said he is not only concerned about the impact on his county jail, which he said is often at capacity. Elder views the bill has a slap in the face to law enforcement across the state. "By saying that we shouldn't ‘fight the war on drugs because we don't win,’ that's just crazy," he said. "When legislators say drugs are a victimless crime, they have absolutely no idea," said former Colorado Springs narcotics detective Chris Brown. For Brown, this is personal. His brother-in-law, Deputy Micah Flick, was killed in the line of duty last year. "The pain of losing Micah and knowing that he was killed by someone that was addicted to meth – reducing it from a felony to a misdemeanor it takes away the consequences of a choice," he said. Brown also believes it will take away detectives’ bargaining power to convince drug users to take a deal in exchange for help arresting their drug dealer. "They're called confidential informants and they're a huge, integral part for narcotics investigators to help solve crimes," he said. The bill passed the House Judiciary Committee and Finance Committee and now heads to the Appropriations Committee.